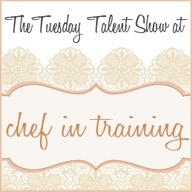 Hello all and welcome back to this week’s Tuesday Talent Show! Since the party is starting late, we will just get the party started. I apologize for the lack of features, I just didn’t have time to get around to posting them this weekend. Next week you can bet they will be there though. Thanks so much for the party Nikki! Nikki, you and your husband are adorable! Beautiful photos! Thank you for another great party! Thanks for hosting. I need to get in the kitchen and whip up some of these. Thanks for hosting, Nikki, even when life gets crazy...we all appreciate it! Hope you have a great week! Glad you had a great Labor Day! Thanks so much for hosting. Thanks so much for hosting today! Have a wonderful week Nikki! Thanks for hosting. #100 next week. How exciting! I'm new here--but I love your site and the linky party is fabulous! thanks for hosting!